Our current unit of study is matter. We are using the Delta Science Model called Changes. It includes many hands-on experiments working with solids, liquids, and gases and the changes from one form to another. Bill Nye is one cool scientist! This site has lots of great videos explaining our amazing world. We have three main curriculum areas to cover in third grade: matter, rocks and minerals, and plants. 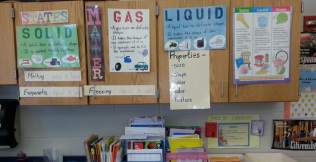 In third grade, matter is the study of solids, liquids and gases. We conduct many hands-on experiments changing one matter into another. The following sites offer information, activities and videos for you and your child to explore. The study of rocks and minerals as well as erosion and weathering are also part of our grade three science curriculum. Check out these wonderful sites for more information on these interesting topics. Our third science curriculum area is the study of plants. We learn the various parts of plants and their importance to the life of the plant. Children also study different ecosystems and the plant life found there. The following sites add some great information to support what we are learning in the classroom.